Unlocker is one of the most useful cleaners ever to be created. Not only that is lightweight and it integrates into Windows shell, but it can also list and close programs that use a file that you want to delete. 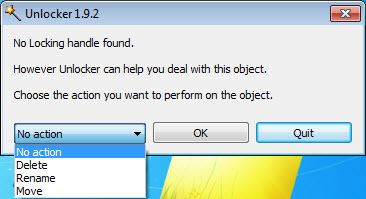 So, whenever access to a file is denied, there has been a sharing violation or you can’t delete a file because it is used by another program or user, turn to this simple software that allows you to delete everything by right-clicking that particular file and choosing to kill the process or to unlock the file and delete it in the same time. There may be other similar programs out there, but this is the only one that also unloads DLL and index files without the need for a reboot. It runs on all Windows versions, including Windows 10. Fantastic tool to remove locked files and eject media etc..
Just awesome and very handy software. Can it just unlock? Not delete? I have loads of MY FILES that Windows has decided to lock so I can’t use them, back them up or anything. No idea why it chose some not others, but it should never have done it to any of them.